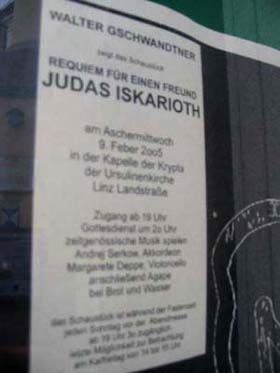 "Requiem for a Friend, Judas Iscariot" reads the notice, above left, posted in front of the Ursuline Church, above right, inviting pedestrians to enter. 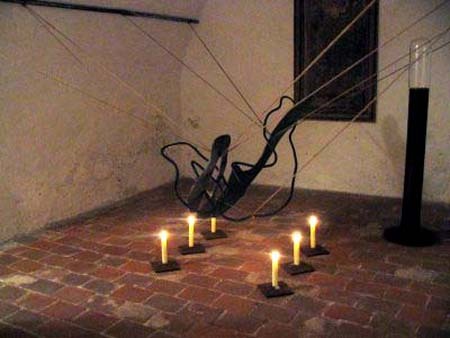 It is Lent 2005 in the Diocese of Linz, Austria, and the "requiem" consists of an exhibition of art dedicated to Judas. The exhibition is open every Sunday before Mass during Lent, and has a special showing on Good Friday. The text accompanying the display proposes that Judas should be made a saint, the intercessor for all those who commit suicide, as well as those who are excluded, excommunicated and despised. The works by artist Walter Gschwandtner are displayed in the Crypt of the Ursuline Church, on the very site where the bodies of the dead nuns were laid out before burial. 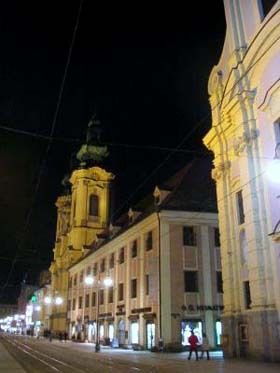 It is implicit that Bishop Maximilian Aichern of Linz approved the display. Below, a modern sculpture that supposedly represents Judas with a halo. It is not clear whether the lighted candles are part of the art display or were placed there by devotees of Judas. It is not clear also whether the parish priest added a Mass to the exhibition to make the "requiem" more complete.